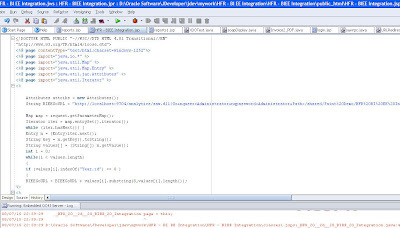 So, lets start with creating the jsp page in JDeveloper. The below code is a sample jsp code that i created for passing the month from HFR to the BI EE report. 2. 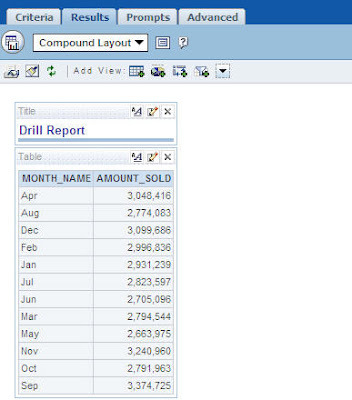 Parses the CONTEXT parameter and extracts the dimension value for the Year dimension. 3. Then it appends the extracted dimension value to a string which in turn is a BI EE Go URL. 4. Once the Go URL is completely generated, the jsp redirects the page to the BI EE Go URL. Now, the above URL should automatically filter our target BI EE report for the Feb month (it is assumed that the BI EE report has the proper is prompted filters). Once the above check is completed, the next step is to include the below link in the related content link in HFR. Now, once you click on a HFR measure, you would notice that the filters get passed from the HFR report to the target BI EE report. I picked this up from Mark’s blog here. Actually, i was expecting this to be released only by the end of this week. But yes, always sooner the better. The new release of the entire EPM is available for download in edelivery. There are loads of new features in this release. I will list some of the interesting new features one by one for the BI Components in this release. 1. A new UI called Essbase studio has been release which supersedes the Integration Console & the Administration Console of Essbase. But both of them are still available in this release. 2. Support for JDBC connection to extract data. 3. Support for a concept called as XOLAP(Extended Online Analytical Processing). One can now completely model Multi Dimensional cubes with Outlines sitting in Essbase and the data coming in from relational sources. 4. Supports typed measures. Measures need not be numeric anymore. 5. Inbuilt Lifecycle management for migration. 6. Support for use of Environment Variables in Calculation scripts. Now, one can have system level parameters in Calculation Scripts. 7. Parallel load of SQL data into Essbase Databases. In this version one can run upto 8 rule files in parallel using the same authentication. 8. New Report level Calculation functions have been added. 9. New MDX Functions – This has more relevance since BI EE using MDX over an XMLA connection. 1. The most important addition here is that one can now add BI EE reports, dashboards, Delivers & BI Publisher within the workspace out of the box. 3. A new searching feature that can now search for all Workspace related documents. 4. The search feature now can integrate with Google OneBox as well as Oracle Secure Enterprise Search. 5. Support of new high definition pixel perfect themes. This, i believe, is to bring a common Fusion UI across all the components. 6. Copy pasting of documents is now supported. 7. Portlets for the Hyperion BI Plus components to Oracle Portal, Web Center Suite & Sharepoint are now available. 8. Support for Oracle Proxy user authentication. 1. One can do annotations/comments from HFR now. An excellent feature which is currently lacking in BI EE. I believe this feature will also see its way in some form to BI EE in future. 2. Rank function enhancement – From a performance standpoint and also from a functionality standpoint. 3. External files can now be added to Books. 2. New connectivity to Oracle BI Server. 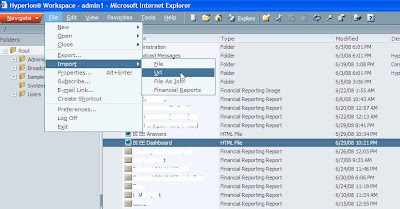 One can now create reports directly using OBI EE Server ODBC connection. 3. New Dashboard Gauges have been added. 4. Enhanced drill through from a multi-dimensional data source to a relational data source. 2. BI EE Semantic layer integration – This is something i need to test out as it says that the semantic layer for production reporting is now integrated with BI EE. 1. 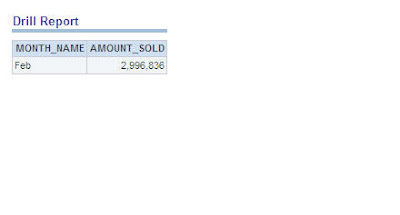 One can do dynamic row and column references. 2. New calculation functions have been added. Some changes in the calculation dialog box. Now, that i have worked on almost all the above reporting toolsets, one thing that i am noticing is that all the tools are converging in terms of functionality. I can see new features that were planned for BI EE also getting added to these product sets. So, no tool is left behind which is very good for existing customers. Also, each of these toolsets are getting integrated. For example, now we have connectivity to BI EE, BIP from Workspace. 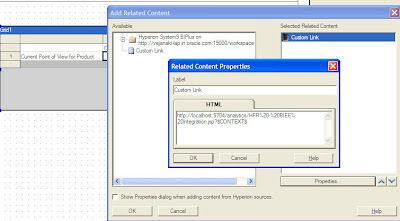 Also, we have portlets for the hyperion components to connect to Oracle Portal, Webcenter suite etc. 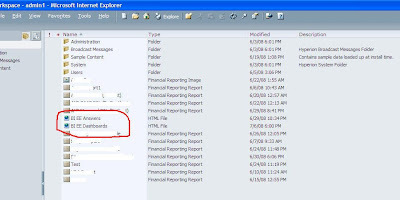 The probable next integration is to enable the out of the box drilling from one reporting tool to another. Lots of things to test in the coming weeks!!! One of the common challenges in working with the current release of BI EE plus is that there is no out of the box integration available between BI E and the plus(Hyperion) components. I believe the coming releases would address that. But if you are working on the current release and if you want to integrate both Hyperion and BI EE components then the coming blog entries should provide you with some methodologies to achieve that. The plus part of our BI EE plus bundle has the following components. The integration methodology of BI EE into each of the above components is different since all of them are different reporting toolsets and each work differently. But the idea is to use BI EE GO URL to enable integration into BI EE. Lets start with Hyperion Workspace and BI EE integration. This kind of integration is pretty straightforward to achieve. This is achieved using a simple HTML page. Workspace can load HTML documents and can open them in a seperate tab within the workspace. So, the first step is to open up workspace and then import a URL. Then enter the dashboard GO URL (http://localhost:9704/analytics/saw.dll?Dashboard&nquser=Administrator&nqpassword=Administrator). For now, passwords would have to be embedded in the URL. If you do not like the passwords to be embedded, use the Public pages approach that i have used here. Now, you would have dashbords page link in your workspace. 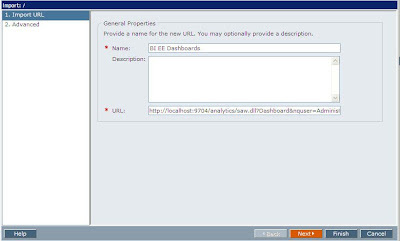 If you try opening this HTML page, you would notice that the entire BI EE Dashboards page would be embedded within the workspace. 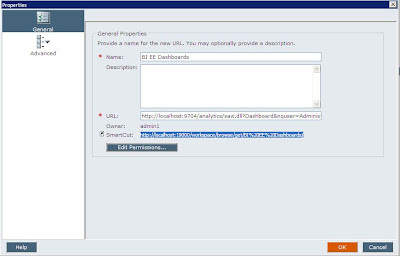 The other advantage is that, the above BI EE Dashboards tab in workspace also has its own URL. Once SSO release of BI EE and Plus products come out, there is no need to even pass the passwords into the URL.